The selection on the website is fairly extensive, I would say there is probably something there for everyone to be able to chose something for any occasion. They give you a choice of cake sizes, types of cake (we went for the double chocolate chip), and of course you chose your design and personalisation. You can even have photos on some. We opted for a photo one as we were interested to see the quality of the photo. The cake was ordered on Thursday and came through the letterbox (yes! It did actually fit through the letterbox!!!) on Saturday. I should also add that it was packaged in such a way that it had survived its journey very well. I came home to a small box through the letterbox and wondered what it was? 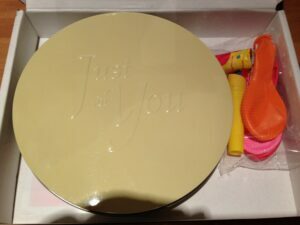 On opening the box I realised that this was the cake. Inside there was a pretty tin with the words ‘just for you’ on the top. Also a little pack with 2 candles, 3 balloons and a party blower! We thought this was a nice touch! I guess if you received this as a gift it would be quite a nice surprise and it was well presented. However, having ordered a cake that said it was 4-5 portions we expected something a little larger, so were slightly disappointed. We appreciate that it needs to fit through a letterbox of course. However, its worth offering realistic advice on the expected number of portions on the website alongside this. On opening the tin the cake was decorated as expected from the picture on the website, but the quality of the photo was a little blurry and my daughter had to be convinced it was a photo of her. Bakerdays Letterbox Cake Review: Website on the icing? We cut this tiny cake into 6 so that we could all have a taste! Our opinions varied slightly, two of the children loved it, one thought it was OK and one said the icing was nice, but he didn’t like the cake. My husband and I thought the cake tasted like a very basic chocolate sponge, but because the cake was small all you could really taste was the icing unfortunately. 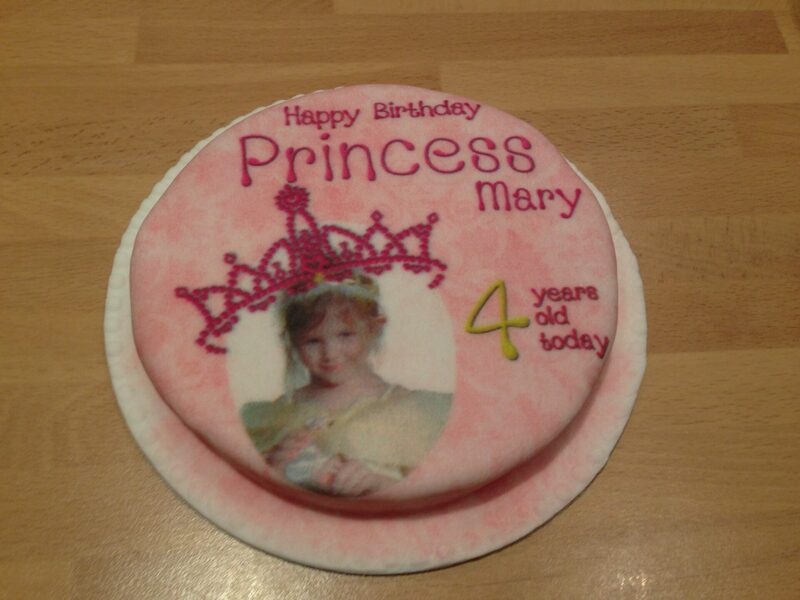 The experience of ordering from the website, and the delivery of the cake were great. The option for personalisation were good too; with a good range of choices. However, I wasn’t overly impressed with the taste of this cake and felt that if I’d have paid for it I might have been a little disappointed. The main problem was the cake was supposed to be 4-5 portions, which made the portions rather small. If the website had said that it was 1-2 portions, I probably wouldn’t have been so surprised by the size. It also made me think that if you were to order the next size up for a party, how big would that actually be? Maybe putting cake measurements on the website would be a good idea? I did also wonder if it would have tasted better in the plain sponge? The chocolate was a bit too overpowered by the icing. Having said all of that, we felt that the tin was probably worth more than the cake, but we hadn’t been intending to buy a tin of course. I think if I had paid £14.99 for this cake I would have been disappointed, simply because of its size. Having said that, the delivery was great though, fast and extremely efficient. Perhaps there is something for everyone on the site, and we were just a little unlucky. We were provided a cake for the purpose of review, all opinion are our own.